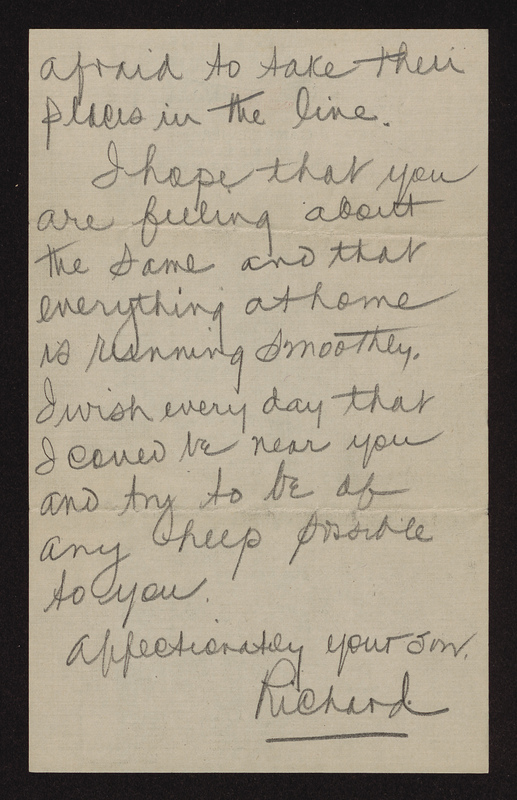 etter from Richard Dillard Dixon to his father, written November 26th, 1917. 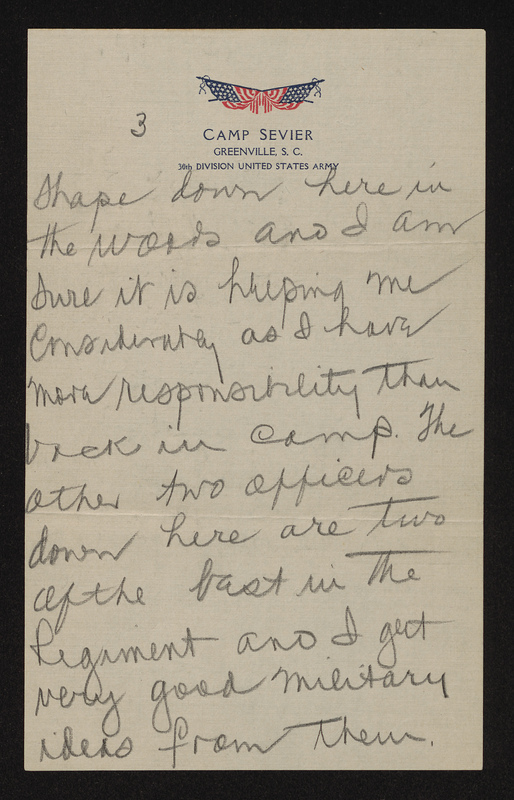 I am still in the same status as I wrote Mary Beverly2 last week – back here in the woods with two other lieutenants and about 250 men who are quarantined for measles. 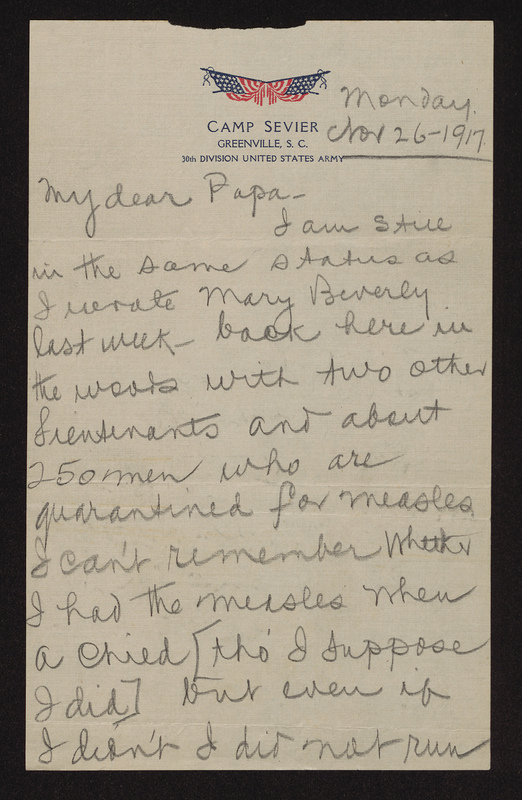 I can’t remember whether I had the measles when a child [tho’ I suppose I did] but even if I didn’t I did not run any extra risk in volunteering to come here to keep these men straight than if I had remained in camp for measles are breaking out there every day and we do not have many new cases down here. Of course as soon as a man has them he is sent to the hospital. 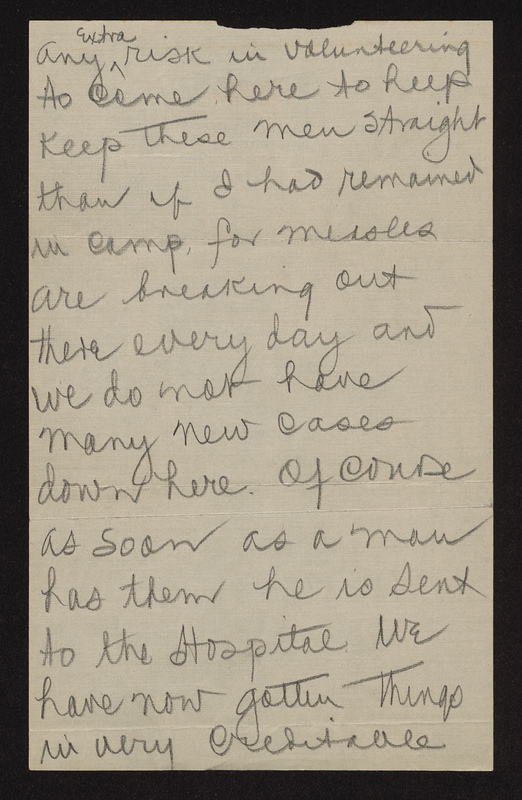 We have now gotten things in very creditable shape down here in the woods and I am sure it is helping me considerably as I have more responsibility than back in camp. The other two officers down here are two of the best in the regiment and I get very good military ideas from them. They are both about my age – one of them, Lt. Crayton,3 is from Charlotte4 and is 1st Lt. Battery “F,”5 which battery was organized at Mooresville6 a small place near Charlotte. Of course the personnel of this battery is made up of men from all around the neighboring country. Crayton has had considerable military experience both in the national guard and having taught and acted as commandant for 4 or 5 years at a large military school. 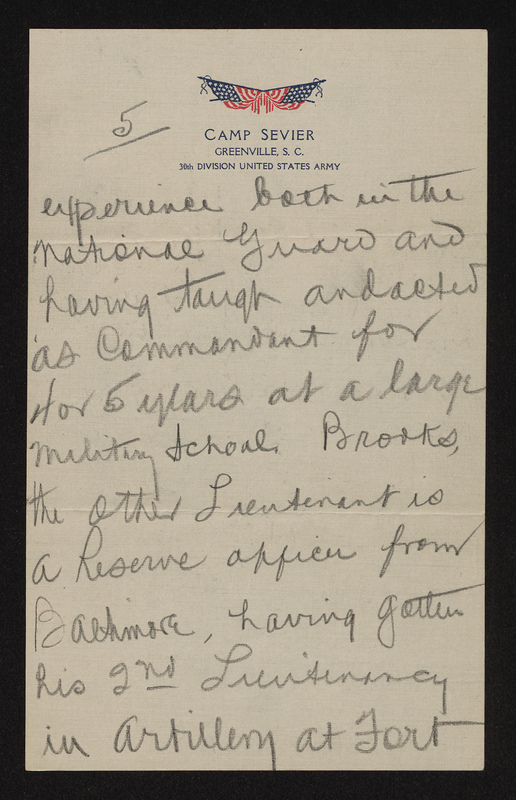 Brooks,7 the other lieutenant is a reserve officer form Baltimore, having gotten his 2nd lieutenancy in artillery at Fort Myer training camp8 last summer. He is attached to this regiment to help in the instruction and is a very bright fellow. We are naturally considerably isolated down here but believe I am getting on as well as the boys back at camp as they are not allowed to go to Greenville9 now. I do not know whether the colonel10 intends keeping us three down here until the epidemic has passed or sending other lieutenants to relieve us shortly. I am rather of the opinion that he will relieve us in a few weeks. 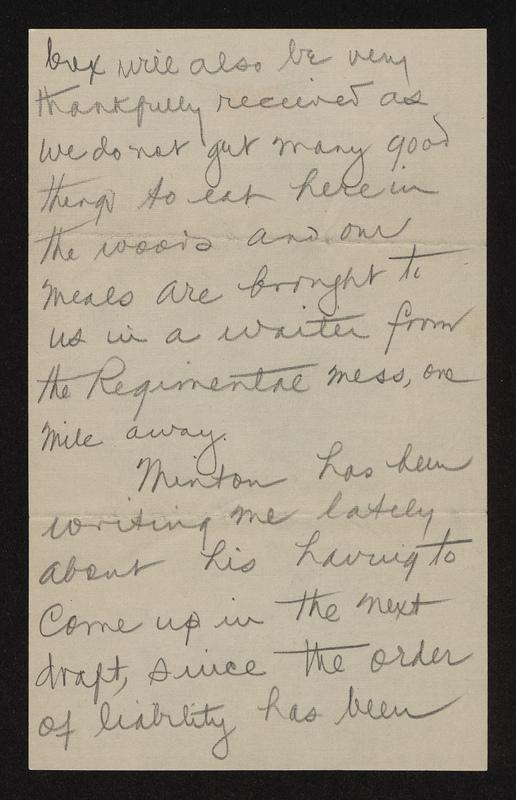 Mary’s2 letter about the box of good things to eat was certainly very acceptable and the box will also be very thankfully received as we do not get many good things to eat here in the woods and our meals are brought to us in a waiter from the regimental mess, one mile away. Minton11 has been writing me lately about his having to come up in the next draft, since the order of liability has been changed, and I have suggested to him that he not wait until he is actually drafted but to make arrangements to dispose of his business and to get into the navy, preferably the navel reserves, as soon as possible. The navy is the best branch of the service. Food is always at hand and a dry place to sleep, not to mention the chance to keep yourself and clothes clean. These things are not the case when foot-soldiers are in the field. 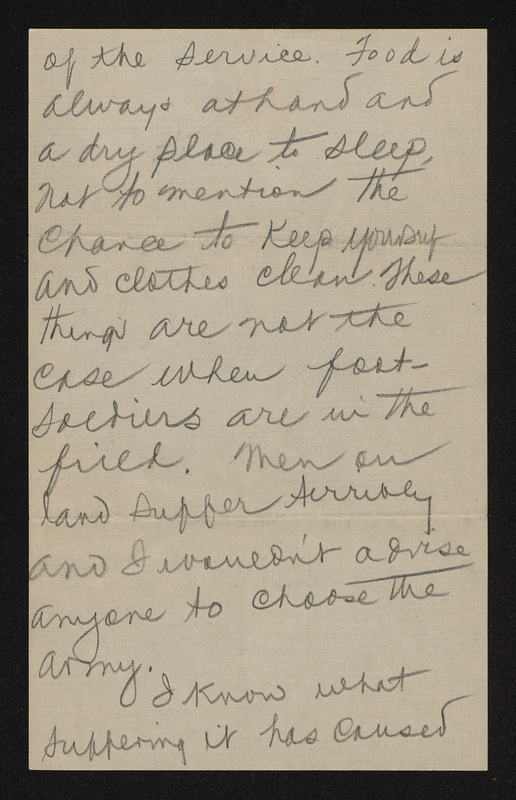 Men on land suffer terribly and I wouldn’t advise anyone to choose the army. 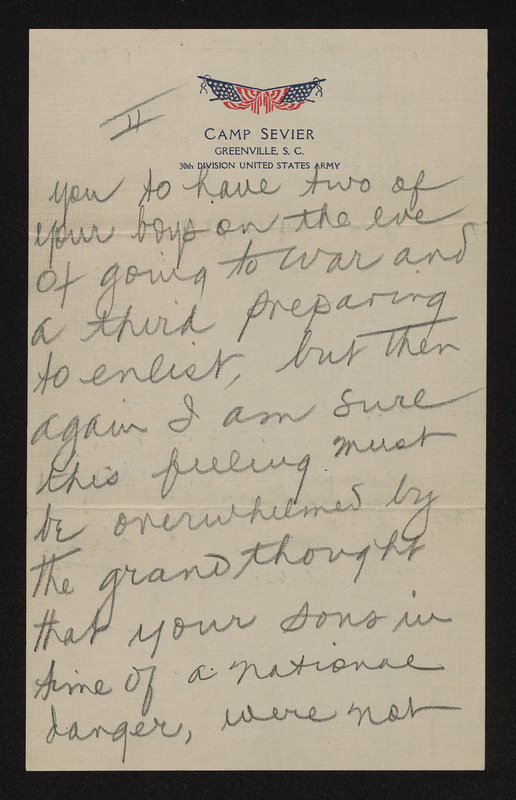 I know what suffering it has caused you to have two of your boys on the eve of going to war and a third preparing to enlist, but then again I am sure this feeling must be overwhelming by the grand thought that your sons in time of a national danger, were not afraid to take their places in the line. I hope that you are feeling about the same and that everything at home is running smoothly. I wish every day that I could be near you and try to be of any help possible to you. Please get Mac12 or Mary2 to procure a photographic album and keep in it the pictures I am sending you all from time to time. 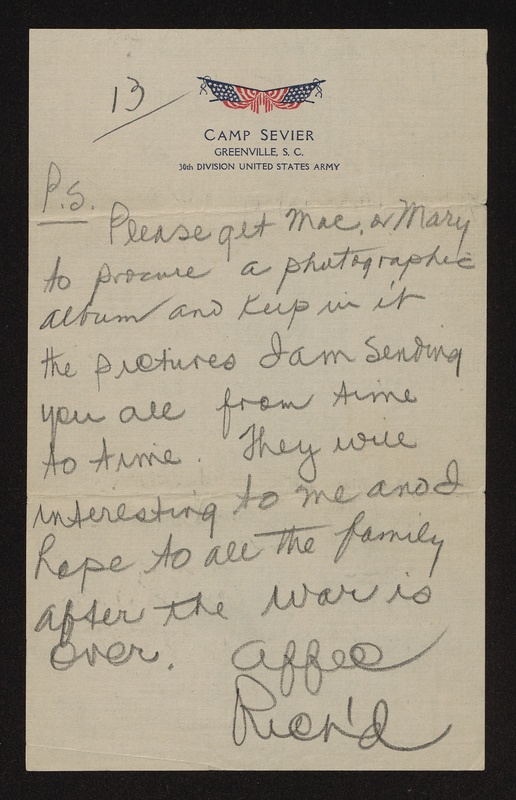 They will interesting to me and I hope to all the family after the war is over. 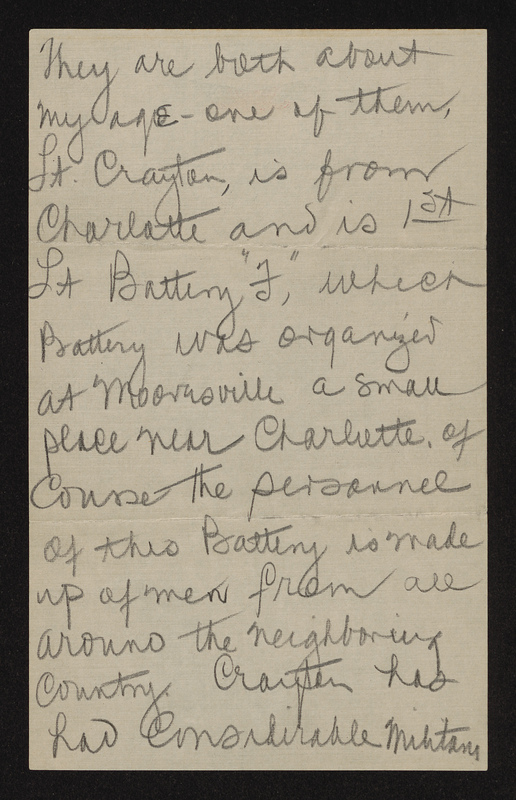 A South Carolinian by birth, Crayton moved to Charlotte, North Carolina as a small child. 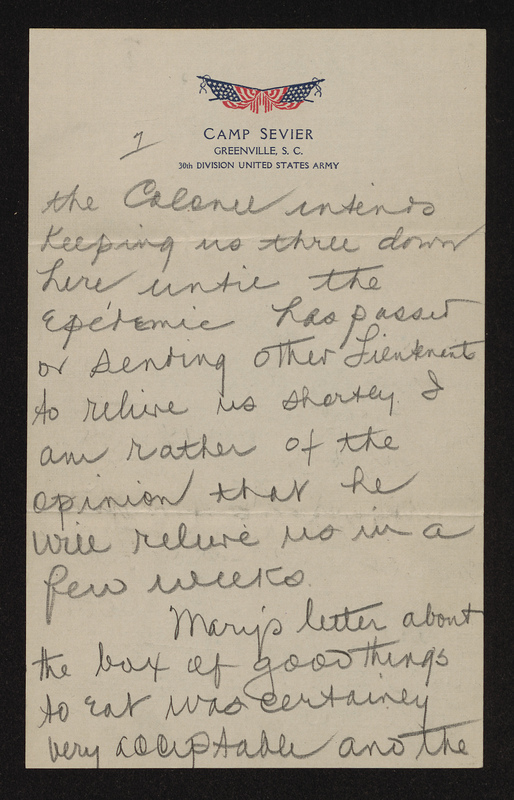 He graduated from Davidson College in 1915. Crayton worked as an agent for his father’s typewriter sales business. In 1917, he became an instructor at Fishburne Military Academy and also enlisted in the National Guard. After federalization, he earned a promotion to major and commanded a battery in the 113th Field Artillery. 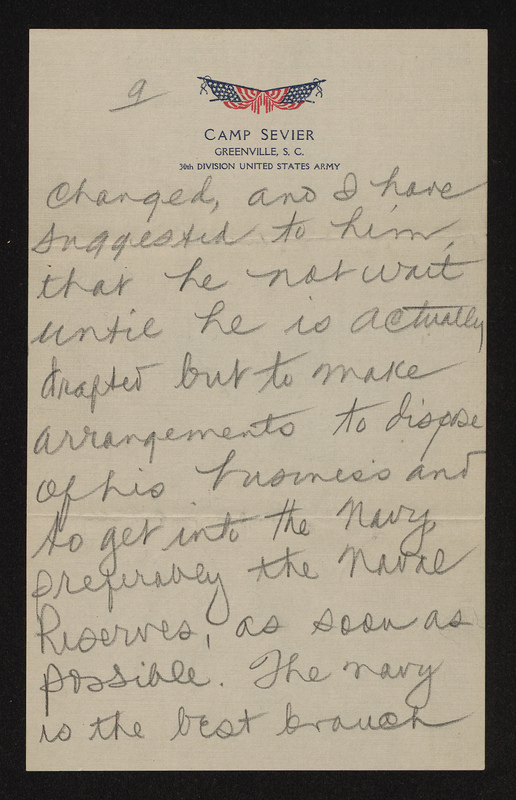 After the war, he returned to Charlotte and worked as a bank manager. Following World War II, Crayton and his wife moved to Florida, where he spent the rest of life selling real estate. View of the intersection of Trade and Tryon Streets in Charlotte, 1917. link: http://www.cmstory.org/node/102346. Charlotte-Mecklenburg Library. Group photograph of Battery F, 113th Field Artillery. From the History of the 113th Field Artillery. link: https://archive.org/details/historyof113thfi00flet. View of Main Street, Mooresville, North Carolina, 1905-1915. link: http://dc.lib.unc.edu/cdm/ref/collection/nc_post/id/2714. North Carolina Collection, UNC-Chapel Hill. A native of Baltimore, Brooks worked as a clerk for a seal manufacturer before entering reserve officer training as part of the Plattsburg Movement. Although he spent time with the 113th Field Artillery during their early training, the army used Brooks primarily as an instructor due to his service with the Reserve Officer Corps before the war. He trained not only artillery units, but also served with at least one aero squadron. After the war, he returned to Baltimore, working in a variety of jobs, including as a construction foreman. 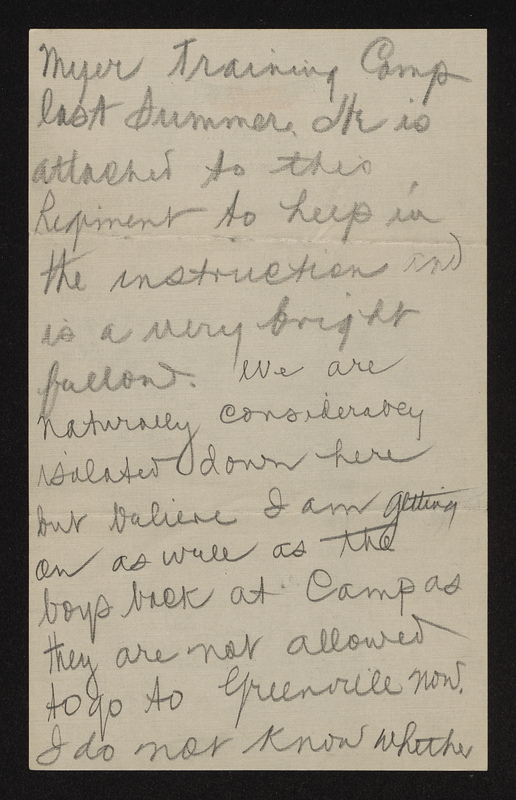 Prior to World War I, as part of the Plattsburg Movement, which sought to prepare America for entrance into the Great War, the army trained college students and young professional men in military drill. Photo of exercises at Fort Myer, 1917. link: http://www.loc.gov/pictures/item/hec2008006113/. Library of Congress.